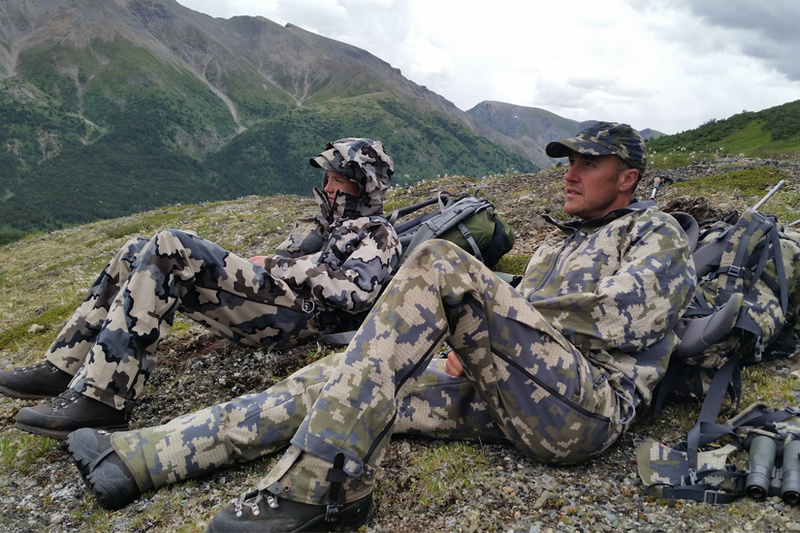 Home : KUIU Blog : Hunt Stories, Uncategorized : KUIU Interview: Spike Lewis, Bolen Lewis Trophy Hunting Co. 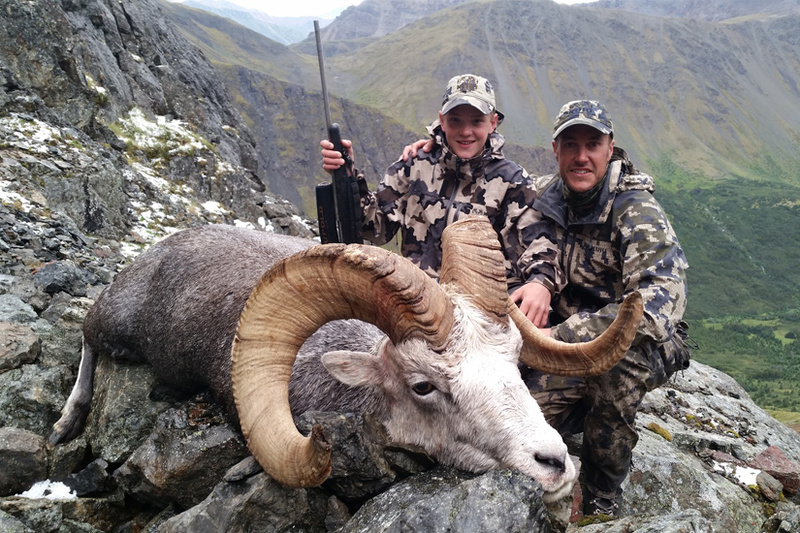 If you ask around or Google “Bow Hunting Mountain Goats,” you will not get far without running into a link or reference to Bolen Lewis Trophy Guiding Co. For the past 12 years, Outfitter Spike Lewis and his business partner Allen Bolen have carved out a niche as one of the premier Mountain Goat operations in the world. 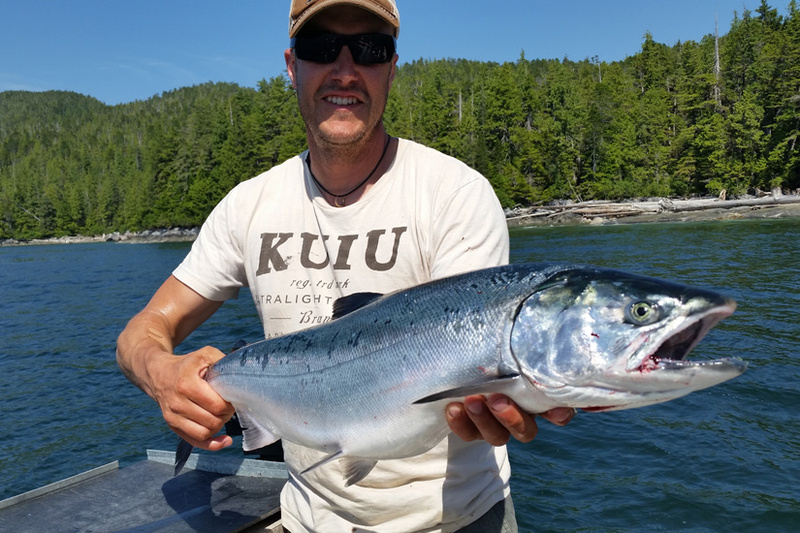 Located in the heart of big goat country on British Columbia’s rainy west coast, Bolen Lewis has become synonymous with archery success for one of the toughest animals to hunt in North America. Spike first started hunting recreationally with his father and grandfather as a kid, and like many Canadians, eventually traded in his hockey skates so he could spend more time in the woods chasing animals. He was able to spend a summer guiding in the Yukon after his first year of college, and has been involved in the guiding and outfitting world ever since. Spike and his wife Kasey have three kids: son Timber, a hockey talent who currently attends a prestigious sports school in British Columbia; and daughters Dawson, 13, and Kimberly, 8. During his off season, Spike and his family enjoy shooting archery, golfing, and fishing. Spike also dedicates his free time to coaching his kids’ hockey teams. Company: Bolen Lewis Trophy Guiding Co. I guess my start in this industry started long before I was old enough to guide. I always hunted with my dad and grandfather at a recreational level, but when I was in my early teen years something inside me wanted more. I would read everything I could get my hands on. Every Outdoor Life magazine, Jack O’Connor book, anything to do with the sport. I dreamed of going to the mountains. I started college when I was 18 and met a great friend, “Yak” who guided in the Yukon. That summer I had my first job in the industry, and to top it off with a Yukon Legend, Dave Coleman and Macmillon River Outfitters. That was one of the greatest adventures of my life, so much unknown. That year was a big blueprint to my guiding career. Dave didn’t always do things the way I do now. I saw the good and bad and the ugly of outfitting and started to form my own ideas of how I would do it. I guided almost every year after that taking the fall season off my business and spending time in the mountains of BC and the Yukon. It wasn’t until I sold my business in 2003 that this lifestyle became my full time job. That fall I met my business partners and some of my best friends Allen and Dave Bolen. The following spring we bought our first area and Bolen Lewis Trophy guiding was born. What is the history of your area or areas? What made you choose it? Our original area is in the North Coast mountains of British Columbia. We wanted an area in the mountains as that’s where we loved to be but couldn’t afford a sheep area so we turned our attention to goat areas. It didn’t have much of a history to it when we bought it, as we split it off another outfitter and It wasn’t being utilized. We got incredibly lucky. We did our research and according to the record books knew the area produced world class goats and grizzlies but to be honest we just didn’t know how good. I know we work hard and have great guides but we couldn’t have picked a better area to help form our reputation in the industry. We have just recently purchased a new area in the northeastern part of BC along the east slope of the Rockies. This was purchased to expand our species selection for our hunters. Again this area was not being utilized and was split from another larger area. It was a question mark for us. We have operated for one season and the area has some good potential for Moose and Elk. The area also has some Grizzly tags and as luck would have it better quality than we could have imagined. 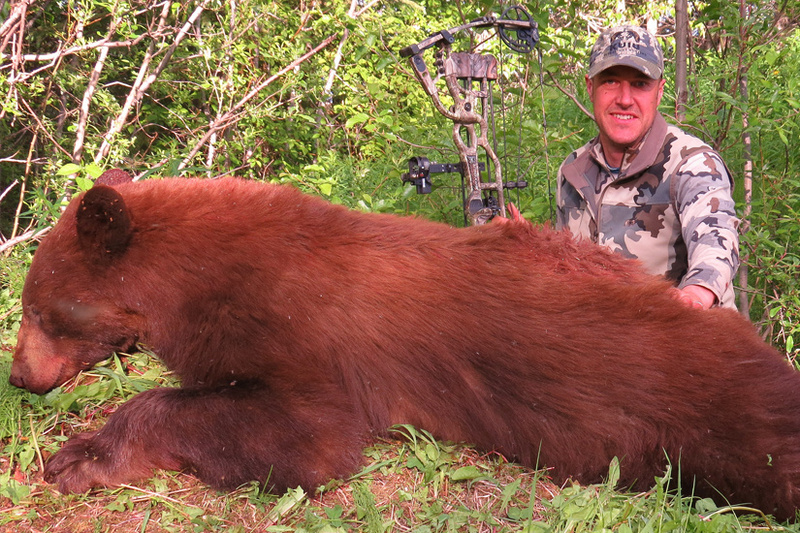 Our first spring we harvested the new British Columbia Archery Record Grizzly and new number 3 in the world all time P&Y. What’s the most challenging or satisfying hunt you’ve been part of—either guiding or for yourself? I have been on so many challenging and satisfying hunts in my life. Like any outfitter so many times I remember it being incredibly tough what I had to endure to get the job done. Weather, heavy packs, dangerous terrain, pulled muscles, strained joints, you name it we’ve all been there. It’s part of the job and we wouldn’t have it any other way. I guess it’s like sports its cool to know you are accomplishing things only a handful of humans can endure. Sick, right? I mean I have twice been on full repel over a 100 ft cliff with whole goats attached to the line with a prussic right above me. We get involved in some crazy stuff. Likewise, I have so many satisfying memories. Arrowing my first Stone ram, helping Allen break the archery world record goat and harvest the new number 3 grizzly in more than dramatic fashion, watching my son Timber flourish into a world class hunter at a young age. Above all these memories stands 2 memories that will by far be the most challenging personally I may ever face. Feb 9, 2005 we had 2 goat hunters in camp. We had spent a miserable day on the mountain we climbed all day thru nasty, thick country only to miss a billy at the top. I will remember every detail of that day. When we arrived home my wife met us in the driveway and the hunters and other guide drove out of the yard again promptly. I wasn’t sure what was going on. I was informed my only sister was killed that day in a car accident. She was 8 months pregnant with her first child and it devastated our family. I remember waking up the next morning and putting on my gear and climbing in the truck to go out with the hunters and my guide. Some people were like what the hell are you doing. I needed to be on that mountain that day. I will never forget that day either. Hard to top that memory but Late in Aug 2007 my wife was pregnant with our third child and one of my guides got injured. I had not planned on guiding as we knew she was close but I needed to go. I took the only rifle hunter we had in camp and thought we would have a slam dunk and be done in a day or two. Lady luck did not smile on me that hunt. The weather set in low on our lake and we were tent bound for days on end. One of my other guides got finished early and our pilot was feverishly trying to get him in to spell me off. I could here the plane circling day after day but they just couldn’t break through. We remained in the tents; the whole time my mind back in Terrace with my wife. Well on the morning of Sept. 3 a text came in on the sat phone. My third child Kimberly had been born and I couldn’t be there. We remained tent bound for two more agonizing days. I remember when the weather broke we only had two days left. I chatted with my wife on the phone and everyone was happy and healthy so I decided to see it through. We got a beautiful billy that day and the next day I was home with my family. That hunt took some big time mental toughness. Piece of must-have gear that most people would be surprised to find in your pack? My must have piece of gear is a small spare headlamp. I’ve had one break and that little spare got me home. Besides that, I hate it when the hunter forgets theirs in camp. It happens. The other thing that never leaves my pack is an old wrinkled up picture of my sister in a Ziploc bag. She was a tough chick and my angel, she’s always with me. My philosophy on gear has always been the same. Light Weight/Compact. I’ve been backpacking seriously since I got my drivers license at 16. It actually makes me laugh when I think of the gear I started with and the evolution on my own packing in the last 27 years. I think at heart all hunters are gear junkies. I can’t even imagine how many hours I have spent researching gear. This has changed in recent years. 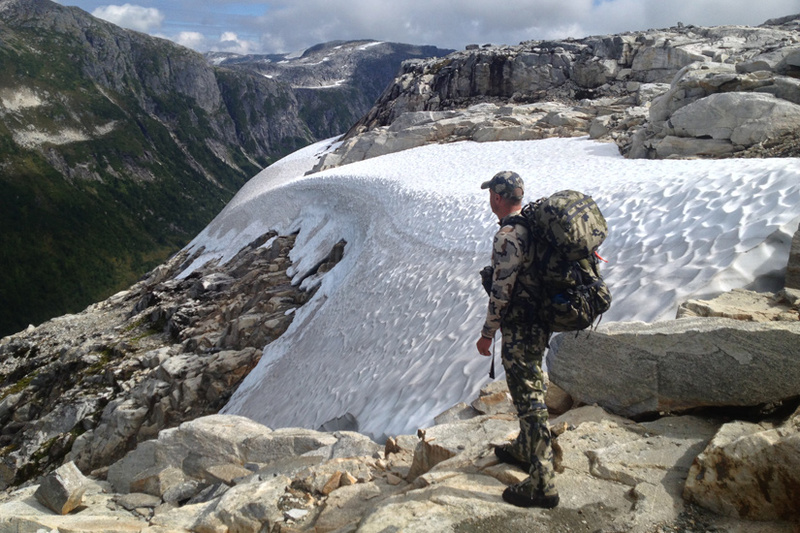 Up to the time I fully committed to KUIU gear I wore only top of the line clothing from mountaineering shops. We started to see more and more Camo specialized mountain clothing coming around but I still wasn’t sold, it still didn’t fit me properly or I had a problem with this or that. I have very long legs for my height and I don’t like wearing floods! I remember meeting Brendan at a show and telling him why I haven’t been using the competitors’ clothing. He said, “You have to try our pants- they will fit you.” That was it. Started with the pants and now I am exclusive. Listen, we outfit in some of the most brutal weather in all of North America. I demand the most out of my gear. If I honestly didn’t think this was the best I could buy I wouldn’t wear it. I am an uncompromising person when it comes to my gear. So to fully answer your question, why KUIU? Well it is the best, and such a full line from clothing, backpacks to sleeping bags and now the best mountain tents I have ever used. It’s also the people. KUIU is the most progressive and forward thinking gear company in my opinion, they have an incredible design team and they seek the advice of professionals and let me tell you they take the feedback to heart. You just don’t have that with other gear companies. That’s how you get the best gear. 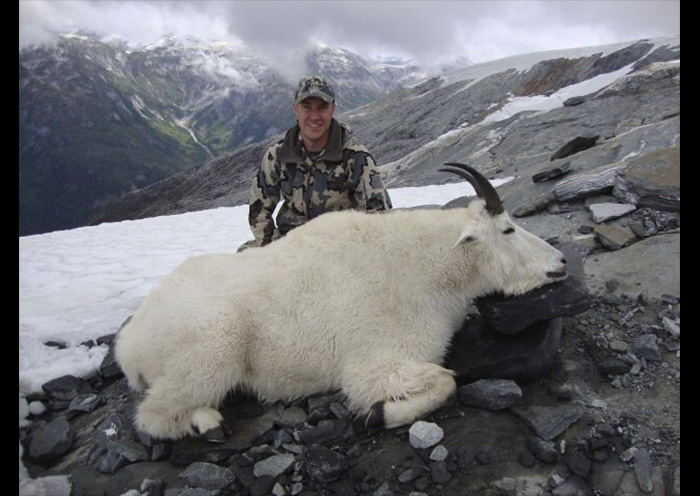 Bolen Lewis has become known for being one of the most successful bow hunting operations for goats. Most outfitters prefer not to take bow hunters, but you primarily target them. What makes a good bow hunting guide? Yes, our outfit does specialize in archery. Allen, Dave and myself were all avid bowhunters before we started Bolen Lewis so it was a natural evolution for us. It is not an easy road to take. Sometimes when I look back at the end of the season I can’t believe our success considering everything we have working against us. Weather, terrain, hunter fitness and animal luck. So many uncontrollable factors. So what makes a good bow hunting guide and outfit? Well our whole team are avid bow hunters for starters. We have a passion for it. It takes this level of understanding to become a great bow hunting guide. It is then up to Bolen Lewis to create the right culture for our guides to be able to take this knowledge and put it to work. I’ve talked to so many outfitters that are so worried about success and how much time and effort it takes to guide bow hunters. “We’re not 100% and our rifle hunters get finished in 3-4 days, why would we take bowhunters?” I guess you have to separate success with making a living. We charge the same amount and we run on average 85% harvest and over 90% shooting opportunity on archery goats. Bow hunters understand the odds and accept them. Why would any of us bow hunt if we needed 100% success? These guys are purchasing an opportunity and we give them just that. No added pressure that they are screwing up our stats some how. We create the culture and then we take our knowledge of the sport, the animals and the terrain we hunt, couple it with massive amounts of patience and we arrive at an incredibly successful operation. Goats live in some of the most remote, rugged country on the planet. What’s your strategy for getting close once you’ve targeted one? The coast mountains offer some incredible terrain for stalking goats. Lots of brush, broken terrain and rounded off ridges create good situations for getting close to goats. Early in the season before snow and the rut comes into play the billies are very lazy, spending much of the day bedded. Patience is your best friend. When we find the goat we want you have to let them get in the right spot and you typically have lots of time to work on them, weather permitting of course. Once we find a goat they are very habitual and as long as we don’t blow them out they remain in the same area. The trick is knowing when they get in the right spot and not hesitating. You have to rely on your instincts. Most goat hunters want to harvest an old billy, but is there a good time to take an older nanny? We target billies and that’s what hunters have their sights set on. We have such a wide range of hunters, both age and physical capabilities. We do allow the odd hunter to harvest a dry old nanny under certain circumstances. The nannies we do take usually are over 10 years old and are dry and will never have kids again. Biologically speaking this is no different to the population than harvesting a billy. What factors determine the best time to hunt goats? When would you recommend a hunter choose early-season versus late-season? We have what I would classify as three seasons to hunt goats. Early season (mid August–end September), mid season (October), and late season (November-February). Hair grows significantly from August to the middle of November. The weather also gets increasingly worse. As the season goes later and some snow starts showing up the goats start moving down and grouping up for the November rut. If you want to kill one with a bow mid August to about the end of September is when we suggest you come. The billies are lazy and up on the ridges. We can camp and come from above and have good stalking opportunities. October is still a good time to backpack but the weather inherently starts to turn worse. This is a great time of the year for a rifle hunter to harvest a nicely haired billy. From November on we hunt from town and do day trips. Big billies are fully haired and the rut is in full swing. Hunting them from the bottom up it becomes more of a rifle hunters gig. We have been successful with a bow but odds are significantly reduced. The biggest piece of advice I give our hunters is to follow the gear list and get in as good of shape they can get in, well in advance of the hunt. This will greatly increase their odds of success and their odds of enjoyment. I was a cross country runner in college so running has always been part of my life and traditionally my favorite way to stay in shape. About a month before the season I also start walking with weight in my pack. This has changed as I have aged. I still run but I spend way more time in the gym keeping my legs strong. I feel like I can get in the same shape as I could when I was 20 but it takes more time and goes away quicker than it did before. I feel staying strong in the gym and spending more time stretching helps my body feel young on the mountain. Since I turned 40 staying in good shape year round and eating right have become an integral part of my lifestyle. I want to enjoy the mountains for many years. When you aren’t outfitting, what’s your favorite animal to hunt for yourself? Outfitting has definitely taken a large chunk of my personal hunting time away. It has been a sacrifice and a grind getting this business to where it is today. I am starting to make more time for myself for my personal hunting goals. The number one thing on my list if I have time on my own is archery elk. I wouldn’t have had the same answer 15 years ago. Sheep and goats all the way. Funny the stages we go through as hunters. The age old question: physical or mental toughness? Both are so important but mental toughness wins every time. I don’t think of myself as some special specimen. I have above average lungs and endurance maybe but I’m not super strong. Looking back at some of the accomplishments in my career it’s definitely the mental toughness that sets most guides and outfitters apart from most people. It has always been in me to just gut stuff out. We really try to prepare our hunters for this. The coast mountains can beat you up. When one of our famous storms hit spending time in the tent can be a hunt ender. I have seen the most in shape guys quit. I have also seen 75-year-old guys with bad legs be successful. It’s amazing. Come with the right attitude and we will have a great hunt. The best wild game I have eaten is pre-rut mountain caribou. Incredibly tender. I have only had the luxury of pan frying it in olive oil or butter with a salt and pepper crust in camp. What a treat. At home nothing tops elk. We try to have a freezer full every year. We make a nice marinade on thick cut steaks and grill them. Yummy. The family loves it. I used Leica products for years but have recently been using vortex with great success. There are so many great optics out there. I always use an angle spotting scope. In goat country lots of time is spent looking up. According to my neck angled is the way to go. What makes for the best field photo? Photos are a big part of our business. What are a few of the things I feel make a good field photo? We try to minimize and wash off blood. Hard to do with goats but it can be done. Make the face look natural. Don’t put your weapon in front of the animal. Showcase the animal. We are not showcasing bows or rifles I feel this takes so much from the animal. I also want my clients touching the animal. We don’t want them way behind. We all are on to that trick and that’s not what people want to see. It’s so easy with the cameras these days. Take a few photos and really study them, look for grass in the way, branches etc. excess blood, hunters position. Take your time and don’t be afraid to try lots of angles and posses. At the end of the season you’ll be glad you did. There are a lot of opinions on what makes a good outfitter. What makes a good client? What makes a good client? We can talk about so many things here like gear, physical preparedness, knowing your weapon, mental toughness. 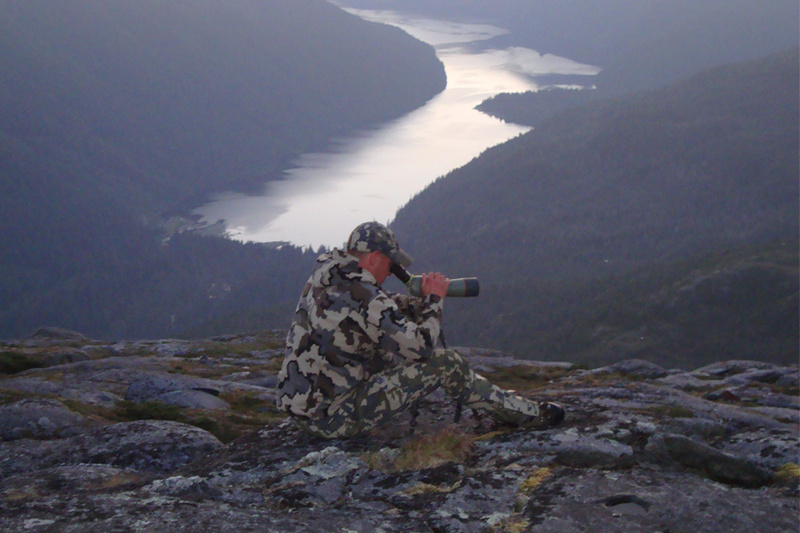 I guess if I had to say one thing it is someone who shows up with the right expectations of the experience they are about to have and not expecting some high fence British Columbia wilderness hunt. It’s a funny thing what expectations can come when money is involved sometimes. Let’s just say it is impossible for me to make someone happy that has expectations that are out of line. We spend many hours talking to our clients and I feel like we are learning to do a better job of managing and setting expectations. This is up to both us and the client to make sure these are in line. I guess it takes a good outfitter and a good client to make sure these are in line. If they are, we will have a successful hunt without fail. Awesome read! 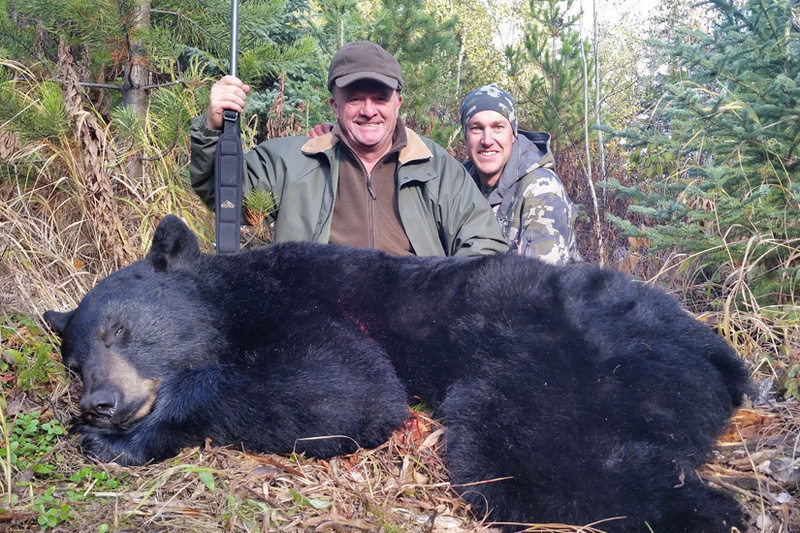 It’s great to learn so much from these experienced guides & big game hunters. Gimme some more! Love it! Archery big game is my passion. Grizzley, Mountain Goat & Big Horn on my list. Bolen Lewis is going in my contacts list right now. Thanks KUIU for the all the INFO!! I spent 7 weeks in backcountry this season and my KUIU Gear held up like a champ. Just as important, all the Non-KUIU Gear that was recommended by KUIU held up great too. Thank you, Wade. We will have more interviews on the blog in 2017. I am glad that you like your KUIU gear–I appreciate your support. Very much enjoyed reading this article. Congratulations to Mr. Lewis and his partners on establishing a successful business, and his enlightened attitude to hunting, guiding and respecting the animals harvested. So different from the many mucho man things you see on hunting shows, after they pull the trigger or release the arrow it is all about the hunter, sickening to me. After hunting B.C. for 48 years I understand how tough a West Coast hunt can be, so I will be contacting Bolen Lewis’s for their North Eastern Slope Rocky Mountain Area as an elk is on my bucket list. Again, congratulations Mr. Lewis in my opinion your heart, head and business practices are right on. Great article, thanks Kuiu for publishing this. 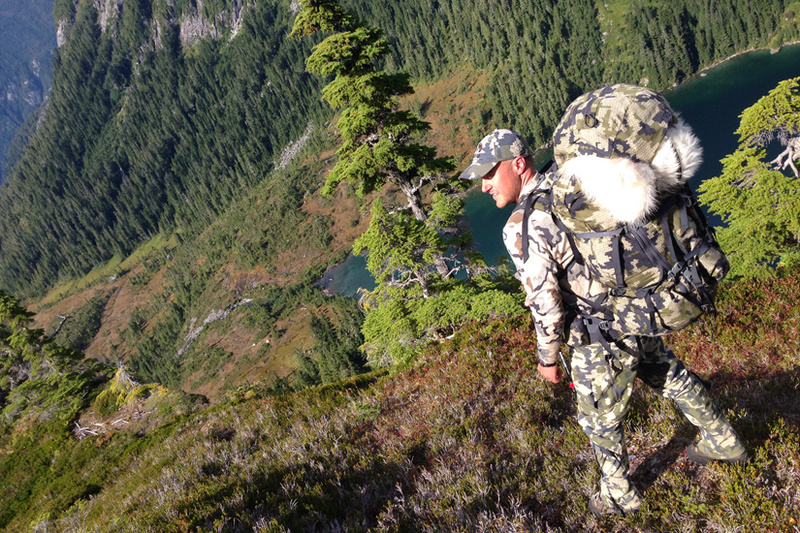 I am glad you enjoyed the interview with Spike- he is truly a great person and an incredible outfitter and guide.